Redemptorists, family and friends will gather October 28 for a special memorial Mass to remember our confreres who have died in the past year. The Mass will be held at 2 p.m. at Sacred Heart of Jesus Church in Esopus, NY. 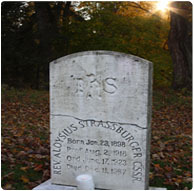 Following the Mass, attendees will have the opportunity to visit the Redemptorist cemetery on the grounds of Mount St. Alphonsus. A light meal will follow in the parish hall at Sacred Heart. Participants needing overnight accommodations must make their own arrangements. An RSVP for the Mass and reception is requested. For more information, contact Fr. Tom Travers at 845-384-6055. Let us not lose the beautiful crown which I see prepared for everyone who lives in observance and dies in the Congregation.